West Windsor, N.J. - College administrators joined with staff from the MCCC Athletics Department to celebrate the accomplishments of Mercer's student athletes at a breakfast April 27. According to Athletics Director John Simone, this year's athletes proved not only dedicated to their sport, but also accomplished in the classroom, with 35 athletes being named to the Dean's List in the fall semester. Many sophomores are on track to transfer to four-year institutions to continue their academic and athletic careers. Numerous players were acknowledged for being selected to All-Region and All-GSAC teams, including soccer players Kadeem Dacres, Mohamed Conteh, Jonni Ventura, and Robin Patton from the men's team, and Irene Calabria Nuevo and Marissa Segal from women's soccer. Special recognition went to basketball player Alexis Sweet for being named an All-American and scoring 1,000 points for the Lady Vikes, only the fourth woman in Mercer history to do so. MCCC's scholar athletes for 2010-11 were also announced. The Male Scholar Athlete of the Year went to soccer player Mark Pratico. Pratico graduates in May and plans to transfer to Rider University, where he will continue his soccer career. The Female Athlete of the Year is soccer player Jessica Villalba, who will transfer to Rowan University to major in Exercise Science. Also recognized were softball players Jenna Comiski and Amanda Myers-Morales, who were selected for Who's Who in American Junior Colleges. Trainer and Exercise Science Program Coordinator John Kalinowski presented "Iron Viking Awards" to softball player Alyssa Becker and basketball player Marcus Jimenez for maximizing their performance during the season and in workouts during the off-season. Baseball team will advance to the Region 19 tournament, to be played at Mercer May 13-15. For final results of the spring season, visit the Athletics website and click on team pages. enjoy breakfast and a chance to socialize. 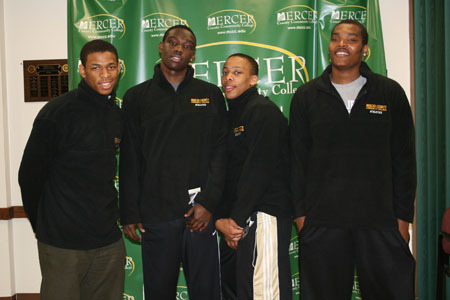 MCCC basketball players, from left, Anthony Obery, Arlington Rowley, Jonathan Jernigan and Gary Carthan. All-American honors for men's soccer. He was named Player of the Year in Soccer for Region 19. 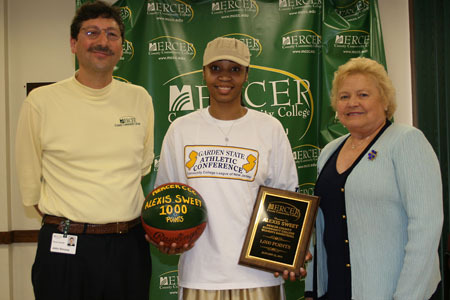 Alexis Sweet was recognized for scoring 1,000 points during her Mercer career, as well as being selected as an NJCAA All-American. She is pictured with MCCC President Patricia Donohue and Athletics Director John Simone. Soccer player Mark Pratico was named the Male Scholar Athlete of the Year. 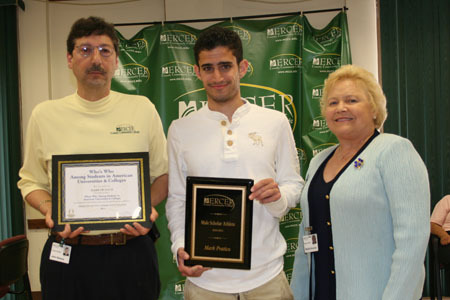 He is pictured with MCCC Athletics Director John Simone and President Patricia Donohue. Pictured with Athletics Director John Simone are softball players Amanda Myers-Morales, left, and Jenna Comiski, who were selected for Who's Who in American Junior Colleges. Tennis players Ben Pinter, left, and Travis McCaughan with Athletics Director John Simone.